As a freelance word-slinger, I am what you might call a VORACIOUS consumer of coffee. I make it in a French press, take it black, and drink it throughout the workday. There’s (almost) nothing I hate more than cold coffee, except an empty coffee mug, which is why I reluctantly agreed to let my wife buy us a $30 ish dollar insulated coffee canteen thingy. Initially, that seemed like a lot to pay for a metal travel mug, but when I experienced the magical heat-containing powers of the Klean Kanteen Insulated Coffee Mug in action, I realized this was no ordinary travel mug. This, my friends, is a mug powered by sheer demon magic. Let’s just get right down to it. This thing is supposed to keep your coffee or other liquid of choice at a nice hot temperature for up to six hours. It does, and even longer in some cases. It’s amazing. I usually make coffee around 8am in the morning or so. Left in the French press, it’s usually lukewarm by around 9:30 am. After I pour my wife and I our first cups, I dump the rest in the Kleen Kanteen. It’s still warm and delicious by mid-to-late afternoon. It’s my new favorite thing in the house…ever. The slight downside? Your bevvy is DAMN hot for the first few hours. Like mouth scalding hot, if you’re not careful. The hotter it is when it goes in, the longer your beverage will stay roasty-toasty. I made my wife a boiling hot cup of tea at 7pm one night to take with her for an outing. She didn’t drink it all, and the next morning I got up at 8am and opened the mug up. The tea was still warm! My solution to the face-melting hot potential of this rad device is to keep coffee in the Kanteen at my work desk and refill my mug from it throughout the day, giving it a chance to cool slightly before drinking. As time passes, I swap to drinking it right out of the Kanteen when it’s a not-face-melting temperature. Despite being hot inside, the double walled design actually keeps the exterior cool and comfortable to grip even when the interior is nuclear hot. I like the brushed stainless finish, though I’m sad this model (the 16. oz size) doesn’t fit an entire French press worth of coffee in it. My wife suggested we buy two originally. I balked, but now I’m kicking myself because it would have been awesome to double the capacity. Imagine: backup hot coffee for long trips. Or: one mug of coffee and one mug of something else hot and delicious. We picked up the one with two different lids, which was a good idea. One lid seals very tightly and can be hooked to your belt, backpack, or whatever very easily. The easy open lid works great too, though it doesn’t keep the liquid from spilling a bit if you tip it too far. Admittedly, I haven’t experimented with putting cold beverages in this thing yet, but my understanding is that ice cold liquids stay cold even LONGER — for up to 24 hours. I plan to test this out with beer…someday, but I’m content with reserving this for coffee for now. 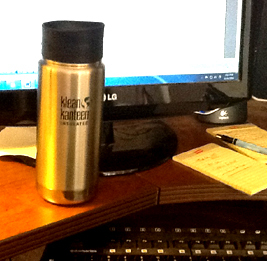 If you love hot coffee that stays hot throughout your work day, Klean Kanteen Insulated Coffee Mug is a must-have purchase. This crazy thing works great as a to-go mug or a means to keep your coffee hot by your desk. I was reluctant about picking it up, but damn am I so psyched about this thing. Highly recommended. Full Disclosure: I receive a small referral fee when you purchase a product through one of the affiliate links mentioned in the reviews above. THAT SAID, I only make it a point to ONLY highlight products that I have tested out and can recommend, and if there are negatives or downsides to a product, I point it out in the review. If you decide to purchase a “Must Buy” product through one of these direct links – HEY THANKS! – this helps keep the site running! This entry was posted in Must-Buy Products I Recommend, WTF Reviews and tagged amazing, coffee, kleen kanteen, kleen kanteen insulated mug, more than six hours warm, must-buy products, nathan meunier, random stuff, recommend, Review, weird reviews, what?, WTF reviews by nmeunier. Bookmark the permalink.